Giovanni Lombardo Radice (born 23 September 1954, Rome, Italy) is an Italian film actor, better known to audiences as John Morghen. Radice is best-known for the gruesome death scenes his characters fall victim to, i.e. in such films as Cannibal Ferox. 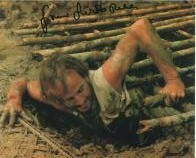 In an interview, he reportedly stated that he wished he had never portrayed Mike Logan in Cannibal Ferox. Radice created his stage name, John Morghen, by taking the anglicized form of his first name (Giovanni becomes John) and using his grandmother's maiden name as his last name (Morghen). His family practically disowned him when they discovered he was using his family name to create incredibly violent films.